Calling All Canadians …. and my aging friends! I’m taking a detour from my Zentangle posts today to help out a good friend with her skin care business. Starting August 1st, the product line will be expanding into Canada. She asked if I would reach out to my family and friends in Canada (FYI – I was born in Trail, BC) and give them some information about her products. I hope you will read the little “note” down below and if you’re interested, give Vicki a quick email. AND, if you live in the US and are interested in this awesome line of anti-aging products, contact her as well. I’m posting this “note” on behalf of one of my long-time sailing friends, Vicki Martin. She has partnered with the two doctors who created PROACTIVE (the acne treatment with 83% of the worldwide acne market). Their new line of skin care products for aging skin is called Rodan+Fields. Vicki is expanding her business into Canada when Rodan+Fields opens that market on August 1st. If you, or anyone you know, is looking for a new skin care regimen to prevent or treat any of the major skin care issues, you will love these products. I have used them myself and can tell you they work (Reverse!). There is also an amazing business opportunity available. When Rodan+Fields launches the Canadian market, Vicki will be expanding her team there. She is looking for dynamic, energetic people to open the market. If you or anyone you know is looking for a business opportunity, maybe a Plan B, or another income stream, this could be a great fit. There are a lot of success stories already from others who are now in the business – just like Vicki! Here’s how you can help me help my good friend … please pass Vicki’s email on to your network of friends and family. She can be contacted at rfvicki@gmail.com. She will talk to anyone interested in either the products or business opportunity in a very professional manner, and will be respectful of your relationships. Thanks for reading this “note” and for forwarding this information to anyone you know. Now ….. back to my tangles! Our challenge this week was a little different … with the summer season in full swing, guest Diva, Amy Broady, asked us to use our favorite beverage in any way, shape or form! You could spill it, paint it, drink it while you tangled, sit in your favorite drinking spot and tangle – the ideas were endless. The main thing was just to “bring your own beverage”! With the hot weather, I love a Starbucks iced chai tea latte. Love them so much that I actually buy the Tazo Chai Tea concentrate at my grocery store. For the price of one chai latte at Starbucks, I get the whole carton and about eight drinks! And they taste just as good. SO … for my challenge I took some iced chai tea and splattered it on my tile. I really like the creamy caramel color on the tile. 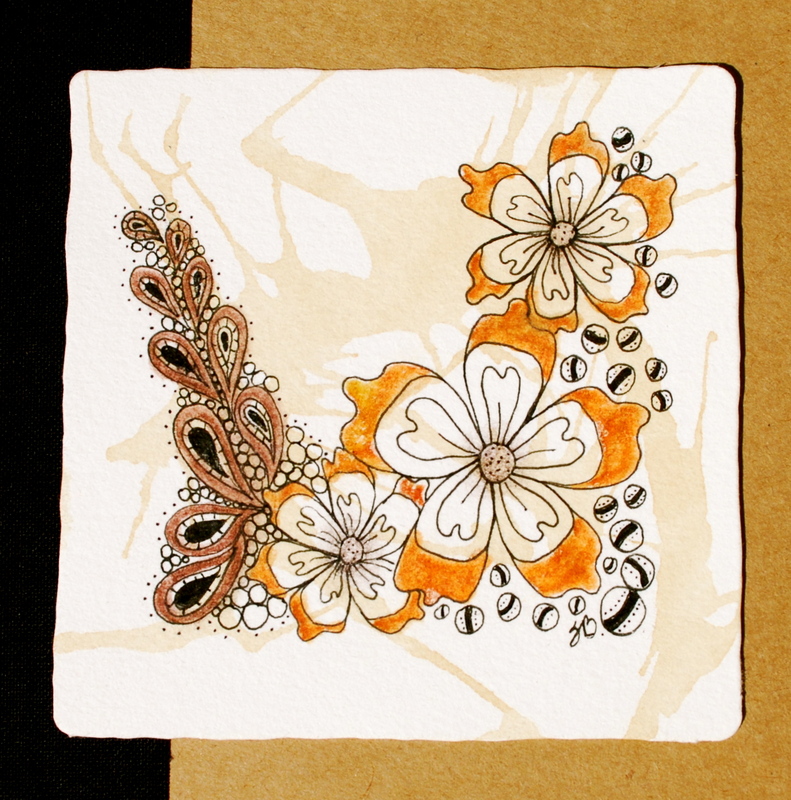 In looking through patterns to learn, I came across YAF which to me looked kind of “India-ish” – like my spicy chai tea. Then I added a few Flux for the paisley look. Like it! Nice and simple, but colorful using a bit of colored pencil. See the other entries at the Diva’s website. So many creative ideas from everyone BYOB’ing! 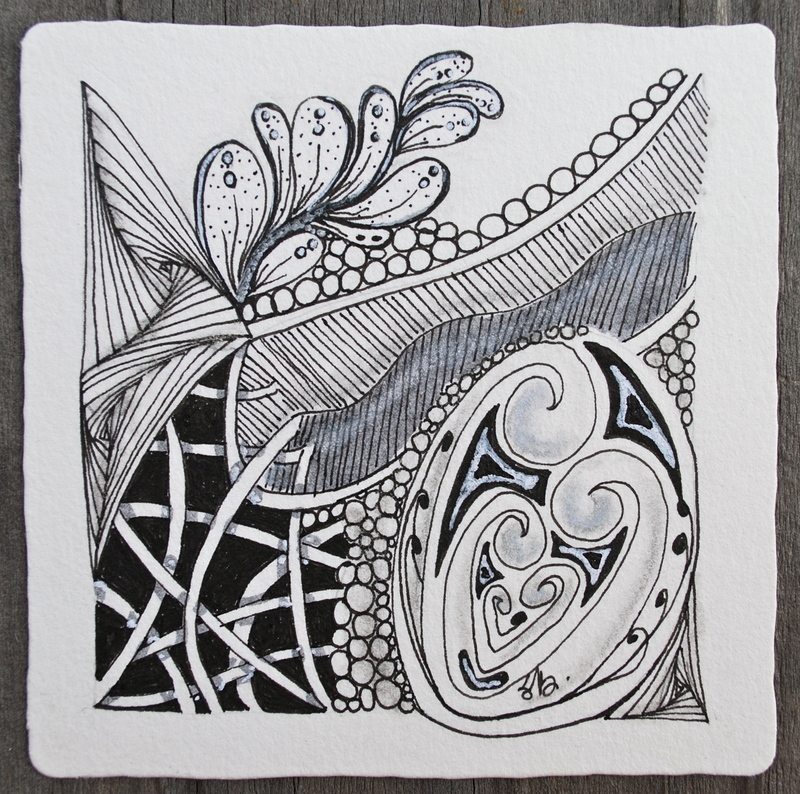 As usual, the first Monday of each month has the Diva featuring a tangle made by another Zentangle enthusiast! This week we use “Crux”, created by Henrike Bratz. I recently purchased ATC cards so decided to do mine on one of these. Once I got started, I realized my design was looking pretty rough/rustic so I just let it go, filling in beyond the lines, shading in different places and added a “funky” border around the whole thing. Looks different than what I usually do … I like it. Go to the Diva’s website to view all the other creative entries. This week’s Diva Challenge was given to us by Aimee Belair, CZT. She asked us to superimpose a string on a string! 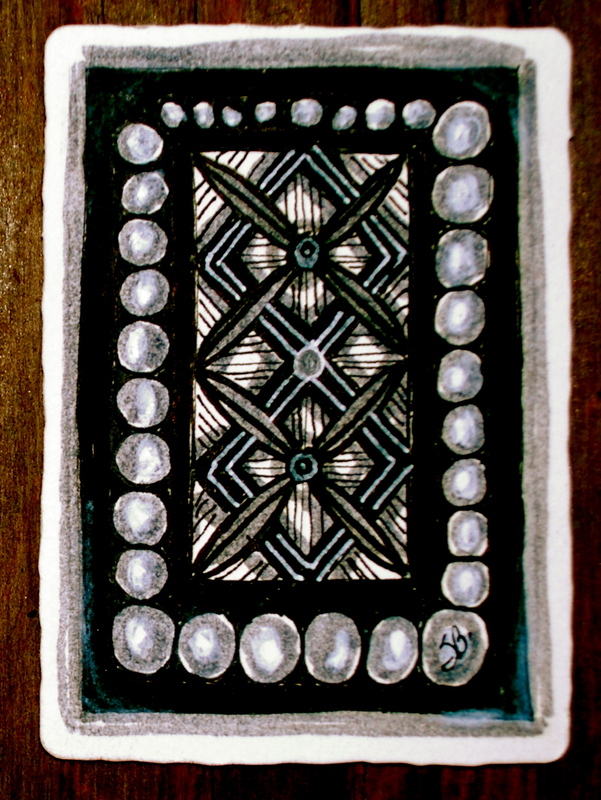 For my non-Zentangle friends, when you start a tile, you draw four dots in each corner, then connect the dots with four lines. Then …. 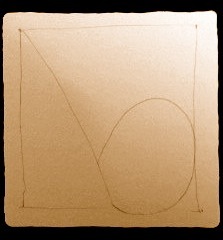 you break up the space by drawing a “string” – any way you want. 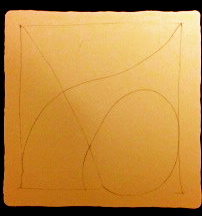 So this challenge called for making the initial string, then adding another string over top. I took before & after photos. The “befores” don’t look too good, but that’s what I got on my phone! View other submissions at the Diva Challenge. The Challenge this week took a little time for me to figure out what we’re supposed to do! In fact, I thought I would pass on this one, BUT, my personal challenge is to get an entry in every week. AND after just completing my CZT course, I have no excuses from now on. 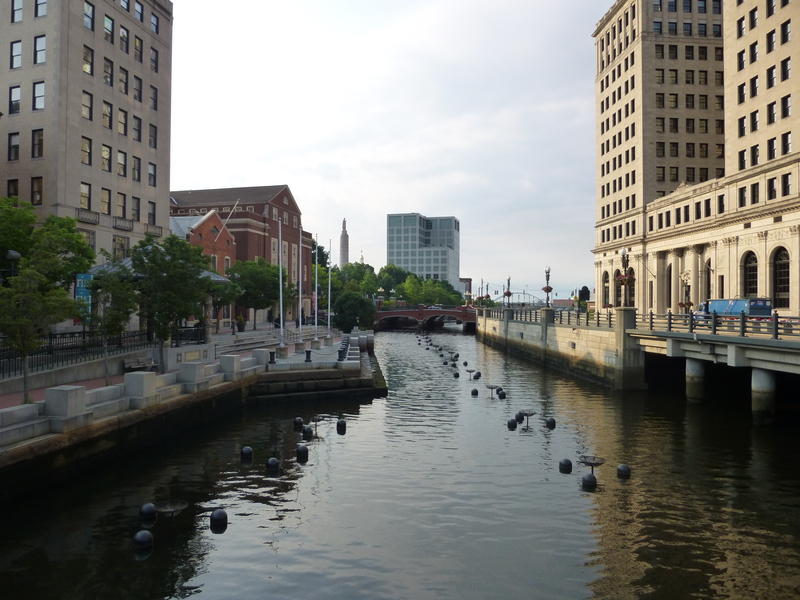 My four days in Providence were so awesome. Along with my high school friend, Janet Masey, I’d been waiting since last September to go to seminar. We had a great time and met so many interesting people from all over. The opportunity to be in the same room with Rick Roberts and Maria Thomas , the creators of Zentangle, was wonderful. What a great vibe they put off – I loved every minute in that classroom. I’m more inspired than before to tangle everyday and see what magic I can make …. one stroke at a time. 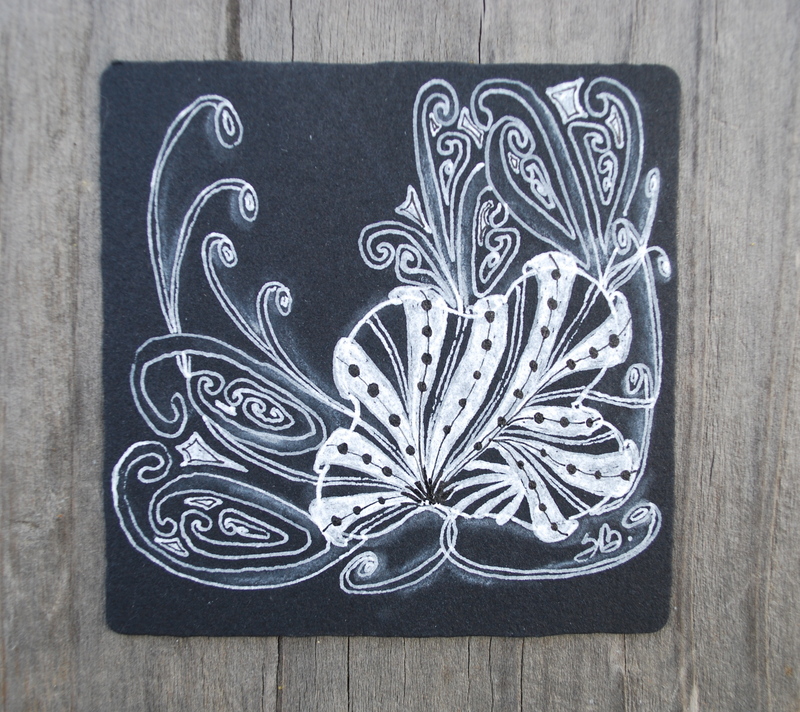 My tile this week is on black – something I don’t use. I opted to use Aquafleur – one of my favorites. It reminds me of something I would find “under the sea”. While at seminar, we learned Mooka from Maria. I was always afraid to try this one, getting all tangled up whenever I attempted to put it down. I like how it flows – when you get the pen going in the right direction! I realized that working with white on black it tends to look a little messy. I need to keep at it and sharpen my lines. Molly Hollibaugh showed us the technique of using the white Jelly pen – to let it tickle the paper as you draw – and that seems to work really well. Here’s my entry for the Challenge put out by Sharla Hicks while Laura is in Providence this week. 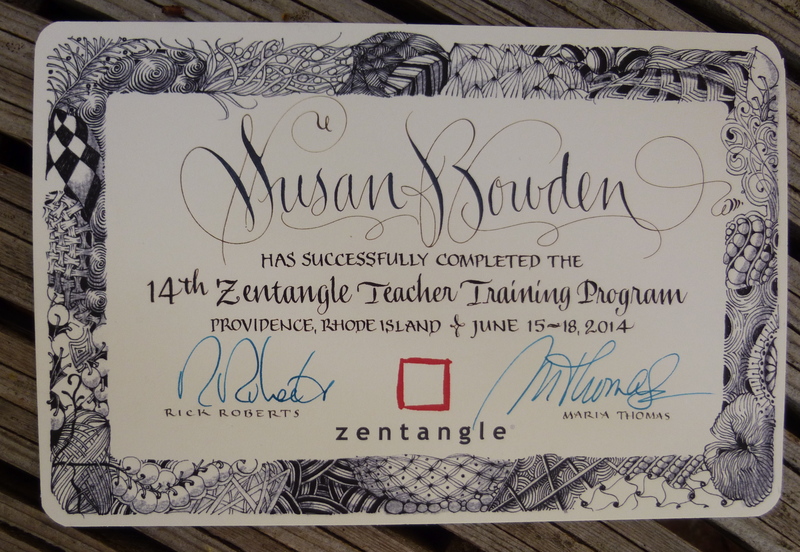 I’ve just returned from four days in Providence, Rhode Island where I received my Certified Zentangle Certificate! What a great time with all the other newbie CZT’s. I met people from all over the US and Canada who share the same passion for this art method. Now it’s time to begin “sharing” the passion ….